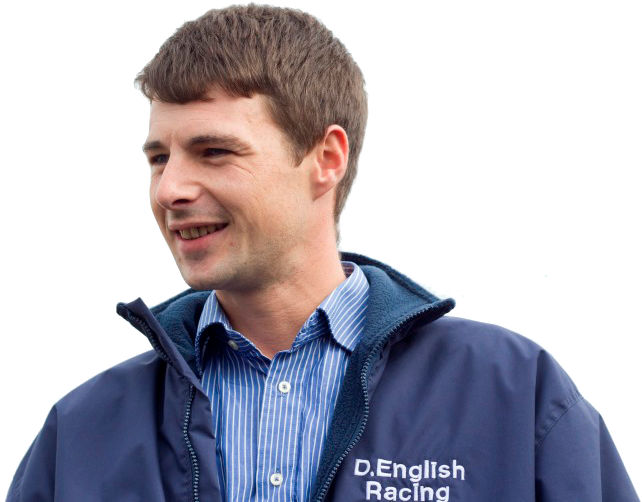 Damian English was just 25 years of age when 25/1 shot Cash Or Casualty gave him his first winner as a trainer when beating the Dermot Weld-trained 6/4 favourite Along Came Casey to land a handicap over the extended mile at the Galway Festival on Friday, July 29th, 2011, just three months after he took out his licence. Cash Or Casualty went on to win eight more races for the Naul based trainer. Damian is noted for his unique ability to turn a bargain into gold dust with the likes of Geological and Bluesbreaker winning six race between them with both horses costing just 800 Guineas. 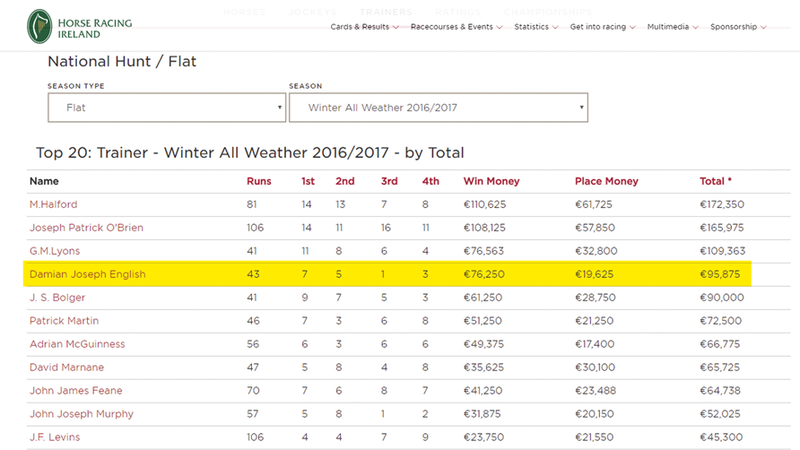 English also bought current stable-star Tribal Path for small money, who won six races in 2016 and placed fourth in the 2017 Irish Lincoln. Damian started his career in racing when he enrolled in RACE, Ireland’s leading racing academy for aspiring jockeys, as part of the course he went on work experience at John Oxx’s world famous yard and also worked under Michael Grassick. Damian took out his amateur’s license and based himself with local trainer Peter Casey, Damian credits his success to the time he served under Peter. However, Damian’s riding career was cut short when he took a fall in a Point-to-Point, this prompted Damian to look at the training side of the game, initially training a handful of point to pointers for his father, Joseph. He soon jumped at an opportunity to buy a flat horse he previously knew from time working with James McAuley, that horse was Cash Or Casualty and the success and nine winners brought by the horse made Damian’s mind up and set about acquiring a string of flat horses. at the Galway Festival, 2011.